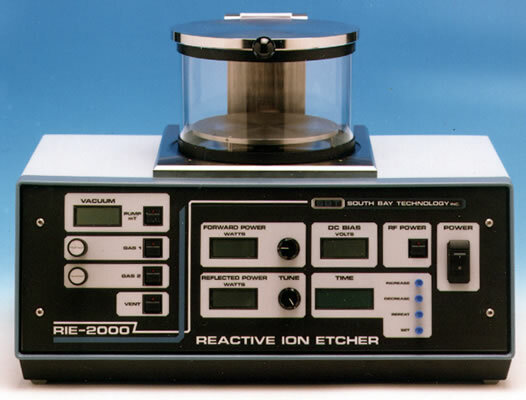 The RIE 2000/3000 Reactive Ion Etcher is specifically designed for anisotropic etching of microelectronic devices. This R&D sized instrument is designed to simulate the operation of larger production instruments in process development and pilot production applications. The RIE 2000/3000 is a turbo pumped system capable of reaching a base pressure of less than 10-6 torr. This low base pressure provides a clean etch environment and highly anisotropic etch without undercutting by eliminating residual species within the chamber prior to starting the etch process. The RIE-2000 model include as standard a two channel precision needle valve gas control and separate vent to atmosphere line. In replacement of the needle valve set up, the RIE-2000 can be equipped with up to two mass flow controller channels for accurate ratio of two species. The RIE-3000 can be equipped with up to five mass flow controller channels and in this case, the MFC controls are mounted into a stand alone cabinet connected to the main system. The RIE-3000 can ratio four process gas species to one species, if needed, or control the flows of each species independently. The rotational speed of the turbo pump can be controlled in order to set a precise pressure with the set mass flows.